There has been regular ringing and research on the Sociable Weaver population at Benfontein Game Reserve, near Kimberley, Northern Cape, South Africa, for the last 18 years. This has provided a new longevity record for the species. Sociable Weaver BC42438 was ringed by Mark Anderson on 29 April 1995 as an adult. It has been recaptured several times, the most recent time being by Rita Covas on 2 August 2010. The elapsed time is 15 years 3 months 8 days, but since it was ringed as an adult it would have been at least 16 years old. The previous longevity record for the species was 11 years 7 months 2 days (BC38092). The Sociable Weaver is now second in the list of greatest elapsed time of any southern African weaver species. The Southern Masked Weaver heads the list at 15 years 4 months 13 days. To see a list of weaver longevity records, see here. To read the full paper, download the pdf here. 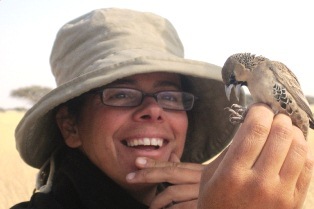 Photo (C. Doutrelant): Rita with the 16-year old Sociable Weaver BC42438.